ARCH is a leading provider of safe and quality industrial inspection and maintenance services in Ireland, UK and other parts of Europe. ARCH is an approved Full Member Company of the Industrial Rope Access Trade Association (IRATA International) showing that we are fully committed to the highest of international standards. IRATA company membership demonstrates that ARCH has been independently audited, and is accountable in terms of maintaining high standards of rope access procedures, personnel experience and qualifications, equipment and health & safety. 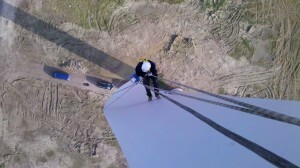 ARCH specialises in the provision of inspection and wind energy services. Our technicians hold specialist qualifications in blade inspection and repair, painting and NDT, and we are experienced in delivering installation and maintenance services on a wide range of turbine types and structures. Our turbine services have been delivered across Europe at locations in Estonia, France, Ireland, Poland, Sweden and UK. All on-site technicians and training personnel are IRATA qualified and work to IRATA’s international Code of Practice. While many companies employ IRATA trained technicians, only IRATA Member Companies can demonstrate that they have been third party audited against the IRATA International Code of Practice. All work teams are led by a qualified IRATA Level 3 Rope Access Supervisor. ARCH provides clients with project management expertise and prepares site specific risk assessments and method statements for all projects in accordance with the local legislation. We are knowledgeable of UK, Irish and European health and safety legislation. Our attention to quality and detail ensures that ARCH delivers safe project completion for its clients on time and within budget. We are flexible and responsive; we respond quickly and deploy qualified work teams at short notice for local and international projects.